Situated in the heart of Bavaro, Punta, on the east coast of the Dominican Republic, this hotel offers luxurious suites furnished all the comforts of home in an unrivaled and beautiful natural environment. 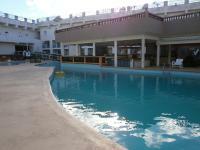 This hotel in Pueblo de los Pescadores Las Terrenas features 2 outdoor pools and a sun terrace overlooking the bay. The apartments include a kitchen and free Wi-Fi. Condo Hotel Caribey provides the apartments with cable TV. Ocean City Apt is a beautiful oceanfront apartment situated on a cliff overlooking the Caribbean Sea in Ruby. It offers beautiful gardens, plus free Wi-Fi and on-site parking. Located inside the Playa Dorada Complex in Puerto Plata, this all-inclusive resort is surrounded by recreational activities and offers luxurious amenities just steps from the beach, shopping and nightlife. This adults-only resort is only steps away from Bavaro Beach in the Dominical Republic. The all-inclusive resort offers a full-service spa, 5 restaurants and evening entertainment. Discover endless activities and non-stop entertainment that this exceptional resort and spa, situated directly on the beach and surrounded by a lush tropical environment, can offer. Perfect for couples and friends. Located 6 minutes' drive from Crane Beach and 5 minutes' drive from Fowl Bay, The Orange Cottage at Ocean City offers an outdoor swimming pool, a wooden terrace and free Wi-Fi. Situated directly on Bathsheba Beach, Round House offers its guests a property that overlooks the ocean. Free Wi-Fi access is available and it has an on-site à la carte restaurant. 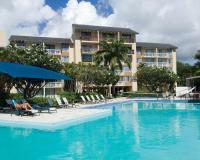 Port St. Charles is an exclusive resort set on an extensive beach facing the Caribbean Sea. All accommodation types overlook the marina, the lagoon or the shore and are connected by free water-taxi services. Offering a restaurant, gym and an on-site bowling alley, Casa Grande is located 5 km from Head Beach and 2.5 km from Grantley Adams International Airport. Free Wi-Fi is available in public areas. Offering a variety of on-site dining options along with a full-service spa and spacious accommodations, this all-inclusive resort is only moments from beautiful beaches and top-rated golf courses. This Negril resort hotel sits on the white sands of Seven Mile Beach. Guests can go parasailing or simply relax in the clear waters of the Caribbean Sea. Rooms at the Negril Treehouse Resort have a view of the garden and are equipped with cable TV. This stylish modern apartment offers a well-equipped kitchen, a private garden with an outdoor dining area and a swimming pool. Paynes Bay Beach is just a 3-minute walk away. Located in a peaceful area of St. Lawrence Gap, this hotel is a 2-minute walk from the white-sand Dover Beach. It features a freshwater outdoor pool, a gift shop and a restaurant serving local cuisine. Located just outside Ocho Rios on Jamaica's north coast, this hotel has its own private beach. It offers 4 outdoor pools, a fitness centre and a spa. Offering private access to the beach located across the street, this property is a 15-minute drive from the center of Bridgetown, the capital of Barbados. It offers an on-site restaurant and bar. Located in Santo Domingo, this hotel and casino features a variety of on-site facilities, including a full-service spa and provides comfortable accommodations, a short distance from area attractions and beaches. This all-inclusive tropical hotel in the historic Garrison District is less than 5 minutes' walk from the beach at Carlisle Bay. It features an on-site restaurant and bar. Located on the beachfront of Fryers Well Point Bay, this villa offers private accommodation with panoramic views over the Caribbean Sea. Some amenities include free airport shuttle and free car rental. 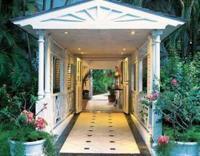 This guest accommodation is surrounded by tropical gardens and is less than 5 minutes' walk from Mullins Beach. Each villa is fully furnished and features a full kitchen. This Dominican Republic hotel is located on the Bayahibe Beach. The hotel offers a lagoon pool on the beach, 5 restaurants, 3 snack bars and 5 bars. Be Live Canoa- All Inclusive rooms offer a private balcony or patio. Featuring 3 outdoor pools, a miniature golf course, and the Baian Breeze Restaurant, this resort is located on the shores of the Caribbean Sea. 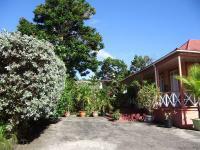 Set in tropical gardens, it is a 10-minute drive from downtown Bridgetown. Placed on the serene west coast of Barbados and facing the Caribbean Sea, this hotel offers 4 acres of landscaped gardens and spacious villas. Sir Frank Hutson Sugar Museum is a 5-minute drive away. This luxurious adults-only resort is located within the Grand Palladium Complex of 5 hotels with full access to all of them including their facilities and features a full-service spa, numerous on-site dining options and endless recreational and.